The euro rose as European Central Bank President Mario Draghi expressed optimism about inflation and the economy, surprising some investors who had expected him to do more to talk down the single currency.Draghi was speaking in Frankfurt after the ECB kept its main interest rates on hold, as expected by every economist surveyed by Bloomberg. He predicted inflation would pick up in the second half of this year and improve through 2017 to 2018, while pointing to an improvement in euro-zone financing conditions. The shared currency reached a session high of $1.1398, a 0.9 percent gain on the day. It was up 0.8 percent at $1.1385 as of 2:15 p.m. London time. The euro was also boosted by worse-than-forecast outlook data from the U.S. 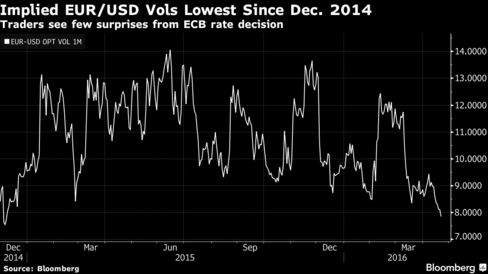 The euro is up about 3.5 percent since the last ECB decision on March 10, even though officials at that gathering cut both the main refinancing rate and the deposit rate, and expanded bond purchases under quantitative easing.Its resilience is partly because the Federal Reserve has signaled it will take a gradual approach to policy tightening in the U.S. The ECB also announced Thursday it will also keep its asset-purchase program at 80 billion euros ($91 billion) a month.“We believe Draghi’s language should continue to be dovish and focus on the credit easing policy rather than the currency,” said Reine Bitar, London-based macro strategist at Invesco Asset Management Ltd.